Note to Android users – please try the Stitcher app for Android here or download the show here. 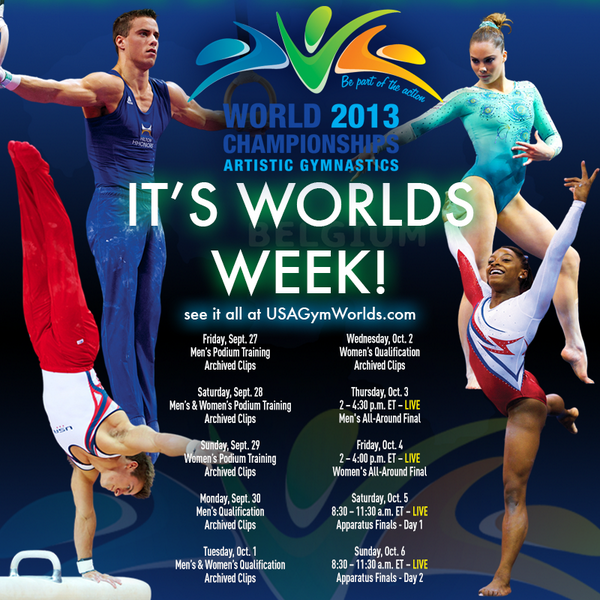 How to watch the 2013 Artistic Gymnastics World Championships. It’s our birthday show! Last week, we turned one-year-old. To celebrate we hear from you. This week, we chat about FIG president, Bruno Grandi‘s latest suggestion to reduce team size to four and his assertion that teen athletes are the “great drama” of the sport, we pick our favorite routines from the Osijek Cup where Epke Zonderland tried to break the judge’s pencils, Sanne Wevers manipulated the code into utter perfection, and Alberto Busnari rocked pommels at age 34. Spanny reacts to the Junior International in Japan where Bailie Key, Catherine Lyons and Sae Miyagawa set the stage for Rio, Al Fong‘s (unsolicited?) response to Jess’s question about the timing of team selection, and delivers the Gabby Douglas movie update and poses the question, will Travis Wall finally choreograph Gabby’s floor routine, now that he has a direct connection to Miss Douglas? USAG’s Scott Bregman stops by to give us the scoop on live World’s coverage. Then it’s time for our World’s preview; our in-depth thoughts on the US World Team, the British team selection drama, injury updates, routines we are most excited for and those we least want to see, who the biggest surprise will be and our top strategy theories – will McKayla Maroney compete all-around?! Finally, we answer the age old question, what is the difference between code-whoring and genius routine construction. Check back all week for our special World Championship mini-episodes and make sure to follow Blythe during World’s. She will be there in person doing her usual fabulous quick hits and interviews: Gymnastics Examiner, Facebook, Twitter. Uncle Tim’s article Fact Checking Bruno Grandi: Is 18 Old? Will do. Thanks for the feedback and thank you for listening! I am seconding this concern as well. I’ve posted a comment before about the huge difference between everyone’s gain in the podcast. If you guys need help with audio mixing, I can help you out (out of love of course =D). I had to turn my car’s stereo volume to the max to listen to this podcast. We just need better sound mixing on the feed. Email me! So, the podcast is not downloadable anymore? I was just about to say the same thing. I usually download it on my tablet so I can listen to it while waiting for the kids to get out of school. Now I need an internet connection to listen. Great episode though. Also whenever they make the rules for gymnastics do they ever take into consideration what the current gymnasts have to think. Do they ever get a say in the sport they are actually competing in. As opposed to people who haven’t in a long time, or never competed. I only listen to it when I’m running or at the gym and I don’t have a fancy phone. Can’t you guys make it downloadable? Jess is going email you for some custom help with this. We want to make sure you can listen! Added a download link on the page for you guys. Thanks for letting us know that’s what you want. Sanne is upgrading?!??! Oh oh please let this happen!! Something worth noting wrt specialists though is that a team with 3 or 4 two-or three-event specialists (as might be possible with a six-member team) is going to be doing more exciting gymnastics than a four member team comprised entirely of all-arounders (which will pretty much be necessary unless the intention is to make quals 3 up 3 count as well as finals). BRUNO has mentioned that if a team also has a specialist they would like to qualify, five athletes from a given country could still attend the Olympics, but this limits the number of specialists to one when in many cases teams have many specialists that could have medal chances (for example, last year when we left at least three gymnasts that could have had event medals at home in Li. Sacramone and Finnegan). I really think the sport ought to be more about showing off the absolute best and if the FIG wants to increase diversity, they should focus on development and making more training resources and opportunities available to gymnasts in non-big-4 countries rather than essentially communicating to the Big 4 countries that training more than a very small number of outstanding gymnasts isn’t worth their time as these gymnasts won’t have the opportunity to be rewarded. Why on earth would we choose to define artistry based on what people like? A truly artistic routine isn’t necessarily going to have a huge amount of mass appeal, but it will be unique, irreplacable and *captivating*. (Think Boginskaya.) I also kind of feel like it’s kind of difficult to find ways to bring “artistry” as it’s defined for WAG into half the events (vault and bars) and they would do well to adopt a definition similar to that of MAG (attention to detail in execution) and then deduct like crazy for it. I agree that the US needs to compete more – honestly if Marta sent every gymnast who could be successful to 2 or 3 World Cups or equivalent-level junior meets (not even including the year’s World or Olympic team) the US would be everywhere, all the time and it would be lovely. That thing with Gabby was supposedly solely by 2012 Nats results but yeah that sounds off to me as well considering she finished 2nd and won day 1. 2011 Nats vs. Worlds makes loads more sense. How much does the gymternet need to pay USAG/USN to stop regiolocking their livestreams? Is this an a la carte cable law thing? Oleggggggggggggggggggggggggg! Please hit in vault finals! “The girl from Egypt” has a name and it’s Fadwa Mahmoud. I think the main problem with these two, Peña especially, is that they don’t block off the right place on the table or with good technique. Obviously they’ve got pretty quick rotation so if they could get the height that comes with a quality block they could probably do the vault… But they don’t. Happy birthday! I’ve loved every interview I’ve listened to! Hopefully y’all will continue to give us a great show for years to come. Have you had Coach Rick on the show yet? If not, I think he would be a good guest to try and schedule. Where would I recognize Allison Taylor from besides this show’s ads? Her voice just sounds really familiar to me. To clarify, that MAG artistry definition would be for vault and bars only- the events with more of a performance element would maintain the current performance-oriented definition of artistry.